Tamang, are inhabitant dwellers of the highland northern Himalayas of Nepal. They are one of the top Tibeto-Burman speaking populations who draw their heritage from Tibet. Their culture, language and religious faiths are different. The Tamang Heritage trekking is one of the newly opened non touristy area treks which combines a charming journey wherein you can enjoy the superb mountain views with the insight into the exceptional Tamang culture, alpine territory, green pasture and rhododendron forest. Trekking through the Tamang village gives you a brilliant opportunity to closely monitor the community’s lifestyle, culture and crafts such as bamboo baskets and mats. Tamang Heritage trek nearby the theatrical views of Langtang Lirung (7245m), Langtang Kerung, Chumse Danda ridge (5122m), Dorje Lakpa (6989m), Jugal Himal, Ganesh Himal, Paldor peak, Shringi Himal, Manaslu and Sanjen Himal ranges. Except culture, there is a hot spring, it is believed that taking a dip into this spring will heal you from your aches and pains.. The trail starts either from Dhunche or Syabrubesi and passes through Goljung, Gatlang, Tatopani, Thuman. Timure, Briddim traditional Tamang villages culminating cultural features. We all know a powerful earthquake 7.8 magnitude shook Nepal on the 25th of April 2015 causing many human casualties and destroying some trekking areas. However, we will operate trekking in Ganesh Himal, Ruby Valley, Bhairab Kunda and Pach Ppokhara areas accommodate by home stay or tea house. Day 01: Drive from Kathmandu to Syabrubesi (1467m), overnight at hotel. Day 02: Trek from Syabrubesi to Gatlang (2238m. ), overnight home stay or guest house. Day 03: Trek from Gatlang to Tatopani (2607m), overnight home stay or guest house. Day 04: Trek from Tatopani to Thuman (2338m), overnight home stay or guest house. Day 05: Trek from Thuman to Timure (1762m), overnight home stay or guest house. Day 06: Trek from Timure to Briddim (2229m), overnight home stay or guest house. Day 07: Trek from Briddim to Syabrubesi (1467m), overnight at hotel. Day 08: Drive from Syabrubesi to Kathmandu, overnight at hotel. Which takes about 8/9 hours. You stay overnight at hotel in Syabrubesi. You head north out of Kathmandu driving through scenic foothills and ridgeline vistas to Syabru Besi passing through Dhunche. While passing along the road at the bank of Trishuli River you catch a glimpse of Ganesh Himal, terraces and green hills. As you pass through Dhunche you feel as if you are heading towards deep land. At the same time, you notice that the road after Betrawati is still under construction. Stay overnight at Lodge. Day 02: Trek from Syabrubesi to Gatlang (2238m). While trekking you can experience some of the Tamang culture. You can see scenery from view point especially as you walk through a local village. The cultural show at Goljung and Gatlang makes your trekking a memorable one. Gatlang set high on a hillside among terraced fields is a Tamang settlement. One can visit a Tamang monastery and beautiful Parvatikunda Lake at Gatlang. Stay overnight at camp/Tea house. Day 03: Trek from Gatlang to Tatopani (2607m). On the way you enjoy the sightseeing of the Langtang range and Ganesh Himal. At Tatopani which naturally signifies 'hot water', you can take a hot bath in natural hot springs with bathing areas in the lap of the mountains. It is believed that taking a dip into this spring will heal you from your aches and pains. This day's trekking provides you an opportunity to experience the Tamang culture. Stay overnight at camp/ Tea house. Day 04: Trek from Tatopani to Thuman (2338m). The panoramic view of Langtang, Kerung, Ganesh Hima and Sanjen ranges can be distinctly experienced from Nagthali. Nagthali used to be a popular meditation center for the local monks and priests. Another cultural village, Thuman, is popular for its Shamanic performances and beautiful view of Langtang. Beautiful views of the mountains can be seen from every house in Thuman. Stay overnight at camp/ Tea house. Day 05: Trek from Thuman to Timure (1762m). While trekking from Thuman to Timure you can visit nearby historical Rasuwagadi. 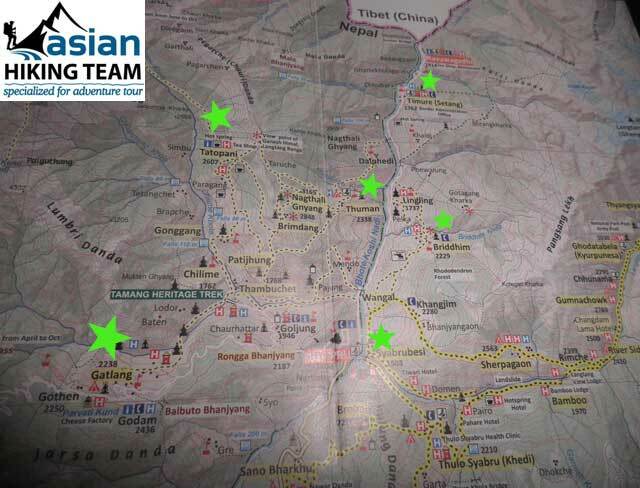 This day's trekking grants you an opportunity to observe Tibeto Burman Tamang culture in two of the villages on the way. Timure is on the old trade route to Tibet. A fort here is a historical reminder of the Nepal Tibetan relations that have existed for many centuries. A suspension bridge here links Nepal and Tibet. Stay overnight at camp/ Tea house. Day 06: Trek from Timure to Briddim (2229m). You can experience the village life of Briddim and enjoy a cultural show performed by community members. You can also experience a home stay and Tamang culture. To mention a little about Briddim, it is a Tibetan Buddhist village in the bosom of Langtang Himal. Around 43 houses are spread in a Z shape. Most of the houses are made up of stone and have roofs of split shake. As direct descendants of ancient Tibetan immigrants, the culture and tradition of Briddim closely resembles that of Tibetan villages. Stay overnight at camp/Tea house. Day 07: Trek from Briddim to Syabrubesi (1467m). You trek from Briddim to Syabrubesi via Wangel. This day the trail moves along a gently descending path passing through villages, terraces and magnificent views of surrounding hills. Stay overnight at Lodge. It is a pleasant drive back to Kathmandu with splendid views of hills, mountains, terraces and villages. You drive along the unpaved road until Betrawati where you will begin to follow a narrow, but well paved road, transfer to hotel in Kathmandu.